You may substitute with 8-passenger seating. Leather-appointed first and second row seating Includes heated driver and front passenger seats. Intuitive controls adjust its height, cushion angle, seatback angle and fore-and-aft positions. Heated front seats Both the driver and front passenger may independently select their own level of heating for their seat. Console, front center with 2 cup holders and storage Front center console with 2 cup holders and storage. Heated and leather-wrapped steering wheel with audio controls Leather-wrapped steering wheel with audio controls is heated to keep you comfortable on cold days. Air conditioning Rear manual controls allow back seat passengers to adjust airflow and temperature for their personal comfort. Defogger, rear-window Rear-window electric defogger. Helps make nighttime driving more comfortable by reducing glare from the headlamps of traffic behind your vehicle. Illuminated vanity mirrors Driver and front passenger mirrors are color-keyed and padded with cloth trim. Illuminates the instrument panel to help you find items in the cabin. Serious boat- or trailer-hauling torque (266 lb-ft @ 3400) for towing up to 5200 lbs. Suspension, Ride and Handling A fully independent suspension is tuned for a smooth ride and optimum handling. Eliminates the need to pump the brake pedal to avoid lockup during hard stops. Instead, sensors in each wheel detect lockup before it happens, signaling the calipers to alternately squeeze and release the discs many times per second. Bose® premium 10-speaker system With sub-woofer. This system is upgraded to the Bose® advanced 10-speaker system with 5.1 Surround Sound when the rear seat entertainment system is ordered. Dual-charge USB port Rear seat passengers can keep their USB-compatible devices charged up with 2 USB ports located in the back of the center console. Included with Color Touch Navigation radio with IntelliLink or the Color Touch Navigation radio with IntelliLink and Rear Seat Entertainment. OnStar® Guidance Plan for 3 months Including Automatic Crash Response, Stolen Vehicle Assistance, Roadside Assistance, Turn-by-Turn Navigation, Advanced Diagnostics and more (trial excludes Hands-Free Calling). OnStar® Basic Plan for 5 years Includes limited RemoteLink mobile app services, Advanced Diagnostics and Dealer Maintenance Notification. Rear child-security door locks Security locks prevent children from opening the rear vehicle doors on their own. Traction control, which detects wheel spin and loss of grip. When it senses spinning, it applies the brake only to the affected wheel and cuts back engine power if necessary to get you going on the wheels with the best grip. Body-color bodyside Body-color body-side moldings. Front halogen projector beam fog lamps Front halogen projector beam. 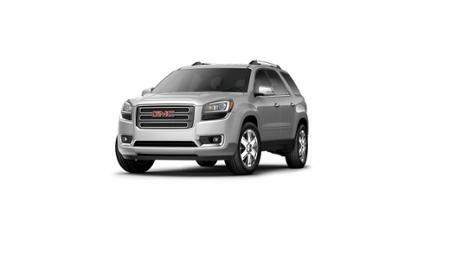 **The features and options listed are for a New 2017 GMC Acadia Limited FWD Limited and may not apply to this specific vehicle.